This article describes configuration of Man-Down and No-Movement Alarm function within the Ascom d81 Protector DECT handset. Depending on the type of the Ascom d81 DECT handset, it offers several alarming possibilities in special situations. This document describes the alarm definition with a d81 PROTECTOR model in conjunction with innovaphone base stations IP1202/IP1202e. d81 Protector phones as well as Protector licenses can be ordered at local Ascom partner only (not innovaphone). innovaphone sells d81 Messenger - updating this with a Protector license will not do! Out of scope are special alarming features in conjuction with special configurable Ascom Basestations IPBS2 and the Ascom UCM platform. Configuration is done by use of the current WinPDM administration software available at the innovaphone download page and the DECT programming charger type DC4. Furthermore, d81 firmware has to be retrieved from innovaphone download page. The firmware contains both d81 Messenger and d81 Protector software parts. Open WinPDM and select the d81. 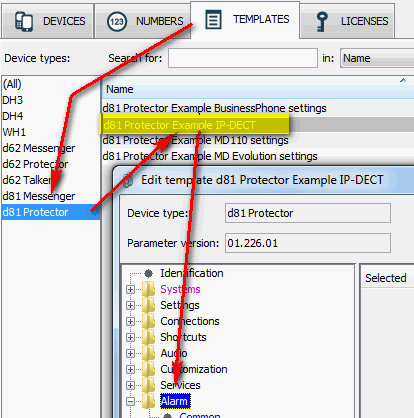 In WinPDM the phone has to be recognized as type d81 Protector. Step to templates and select "d81 Protector/d81 Protector Example IP-DECT"
This page was last modified 14:49, 10 August 2015.